Do you need a car in Iceland? If you are going to drive around Iceland you must rent the car from them! Very good service! It is a family business and they also have a car rental, which I also recommend. The car was good and the prices are lower than the big companies. The car hire was very good value with an up to date 4x4 for the price. We were met at the airport with our car at exactly the time we requested. All very efficient. "good, new car, pick-up worked"
"Excellent Guesthouse. It also offers Car Rental"
We stayed twice, finding always good. Rooms and bathrooms clean and well furnished. friendly staff. They have a good car rental service (definitely more affordable than traditional agencies). "Near airport car rental +"
The managers were very friendly. The model of choice is limited but their price was more interesting than all the offers I had found. So, we spent the night in the hotel and the next morning the car was waiting. Super convenient! Incredibly helpful staff. We would go again in a heartbeat. We rented one of their cars in the morning to begin our trip. When we returned the car they shuttled us to the airport. Fantastic in every respect. Excellent customer service and unbeatable prices! I would recommend Ace Car Rental to anyone looking to rent a car in the Keflavik area! The staff are super friendly too! One of the best in Iceland! Guesthouse very pretty, clean and cozy, with a few rooms and so no queues for the bathroom, only a short delay at the most. I have also used their car rental service, which offers really good prices and new car, with good insurance coverage. Perfect for late arrival, and convenient car rental! 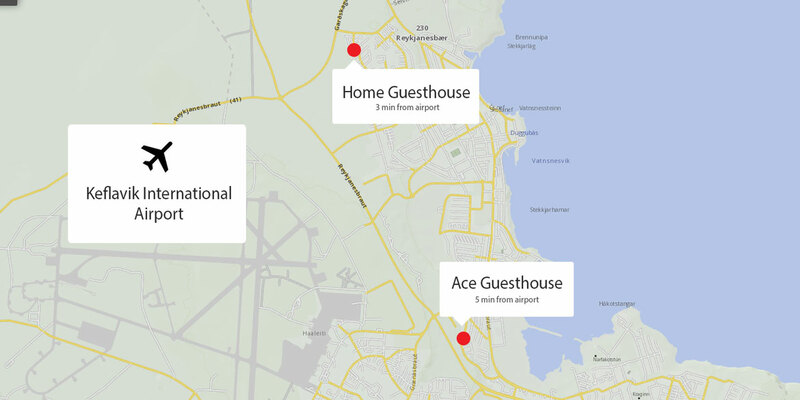 Very convenient Guesthouse 10 minutes from Airport. Warm welcome from the owner even at 1 am. The cherry on the cake is the car rental service offer by the family son for a good car, all insurance included and real good price.